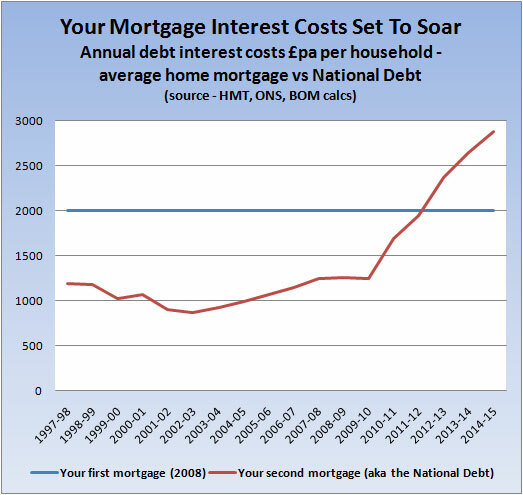 Although ignored by those arguing for continued high government borrowing "to prop up the economy", borrowing unfortunately costs money. 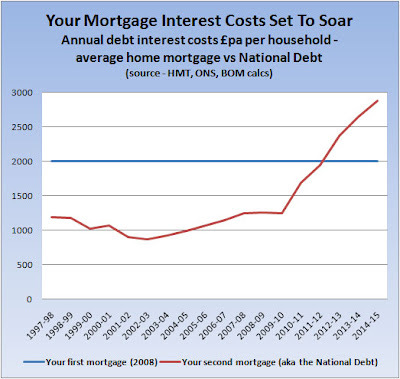 And under the government's current deficit spending plans, the average household will soon be shelling out more in taxes to pay interest on the National Debt than they are paying interest on their own mortgage. Your biggest most onerous debt is the government's spiralling credit card bill. PS There's a curious argument around that National Debt interest isn't really a problem because most of the debt is held by investors inside the UK. The argument was repeated by the lead signatory of this letter from various university academics opposing the Conservative's £6bn efficiency savings. But even if it were true (and actually nearly one-third of the debt is owned by overseas investors), that's a bit like saying that the government employing a few more hundred thousand nappy outreach facilitators doesn't matter because they all live in the UK. It matters to taxpayers who have to foot the bill.